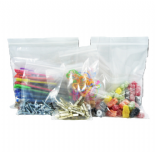 At Empire Packaging we supply a wide range of packaging material which includes these fantastic new grip seal bags. They can be used for personal and commercial use so they are handy to have around, they are made from strong plastic and come in various sizes. The grip seal bags are recyclable however they can be used over and over again. At Empire Packaging, all grip seal bags are half price.